South view of the cross shaft. The cross is dated to the last half of the eighth century, first quarter of ninth century. 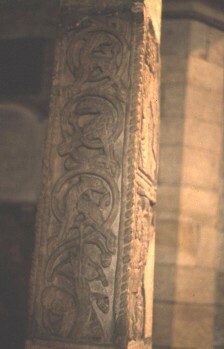 The shaft has vine-scroll design on it. Near the bottom there is an archer who is pointing his bow up and is preparing to fire an arrow. His head is bent back and looking upwards. His right hand pulls back the bow-string, and his left is behind the bow.